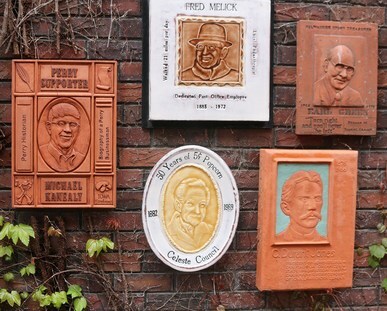 The Wall of Witnesses, on display in Soumas Court next to the Hotel Pattee, is a joint project of Hometown Heritage and the Perry Historic Preservation Commission. This monument honors current and former Perry residents whose leadership, work, and volunteerism make our town a better place. On September 27th at 5 pm, we are celebrating 2017's recipient, Jim Walstrom. Jim is a former Chamber of Commerce Director, the co-founder of the annual BRR ride, and a tireless promoter of the city of Perry. Help us honor Jim at the unveiling of his relief. This event will include stories from Jim's friends, family, and colleagues, the presentation of Jim's relief by a local artist, and refreshments provided by the Perry Historic Preservation Commission.